So, to pick up from where I left off in the story of Frank K. Edmondson’s career, I’d like to share a few thoughts on McDonald Observatory. 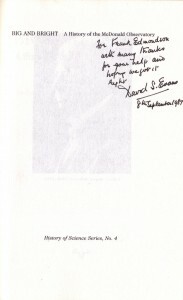 My last post reported the intellectual and labor connections between Lowell Observatory and the Department of Astronomy at Indiana University (established via W. A. Cogshall). Edmondson did the work for his Master’s thesis on the motions of the globular clusters and galactic rotation at Lowell. 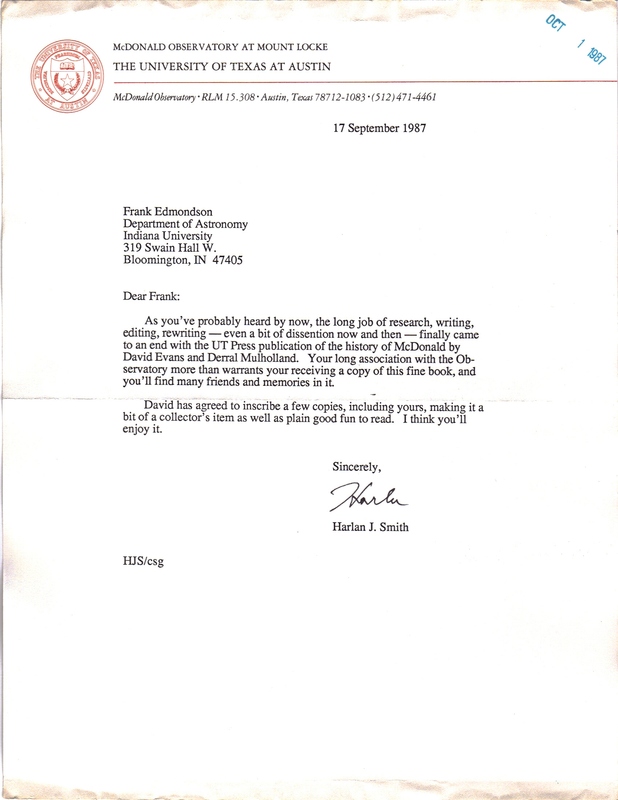 After finishing his thesis, he stayed on for another year at the observatory, taking plates for Clyde Tombaugh, before matriculating at Harvard University. 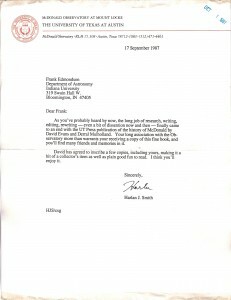 He went to Harvard with the understanding that if he finished his Ph.D., there would be a place waiting for him at Indiana University, and that’s just how it worked out. He apparently had to choose between the new position at Indiana and a more established position at UVa. Howard Shapley counseled him to take the place that had been created for him at IU, because he felt it was more important to expand the number of astronomy posts across the academy than to settle into an established spot at UVa. At the time, it must have seemed like a strange decision. Edmondson had been working on stellar kinematics (study of the movement of stars), so it would’ve made more sense for him to go work with Alexander Vyssotksy, who was focusing on galactic kinematics and proper motion, at Virginia. 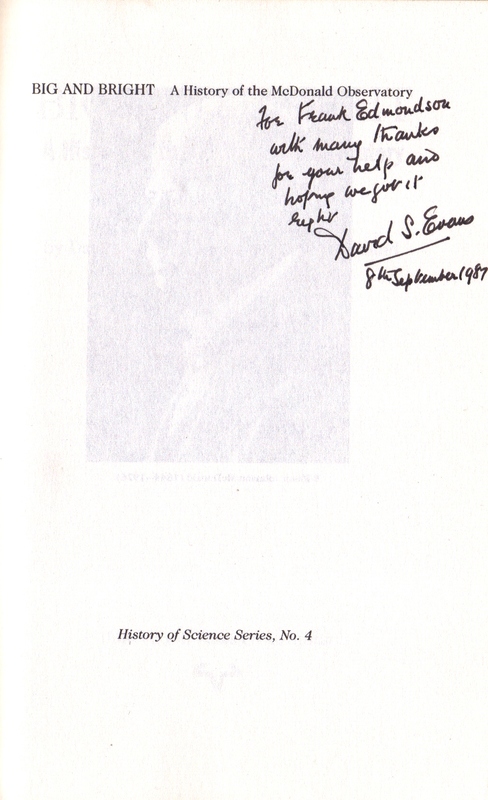 But, as we know, Edmondson had many successes at Indiana, including his role in founding a cooperative project between IU, Texas (McDonald Observatory) and Chicago. Actually, Edmondson credited Otto Struve for the start of the project, noting that Struve had published a paper calling for more cooperation in the profession. 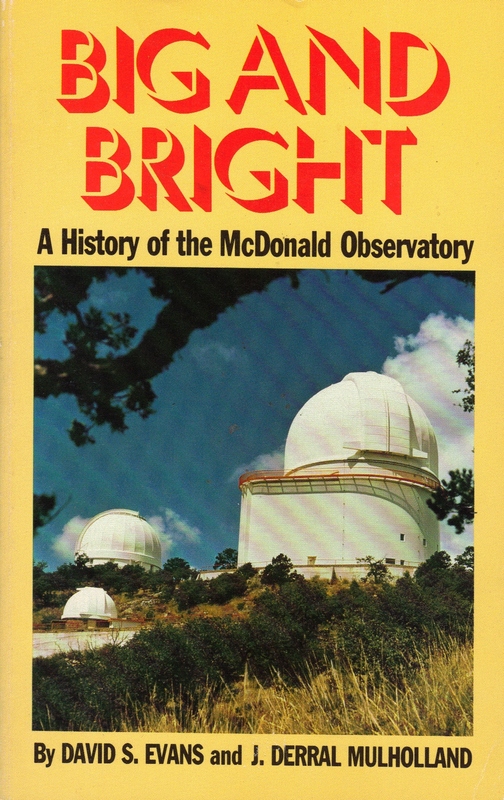 “So his proposal at that time was to get some university interested in this sort of thing, and go to a foundation to get money for a second telescope at the McDonald Observatory. “So I wrote to Struve, and asked him for two or three reprints of his article. I said, “I would like to have our President and some of the deans here read what you have written. At the time of the interview (1977), Indiana University was still purchasing time at McDonald. These days, IU works jointly with Wisconsin and Yale at the WIYN 3.5m Observatory on Kitt Peak, but I notice that an astronomer from Texas Christian University is using the 2.1m Otto Struve Telescope at McDonald to study open clusters from the WIYN Open Cluster Study. Astronomy—still a team sport. I hope Prof. Edmondson enjoyed the read. I know I will.